The Headlands by Clyde Aspevig. Aqua Music by Clyde Aspevig. Thomas Eakins, Starting out after Rail, 1874. William Merritt Chase, Sunny Day at Shinnecock Bay, 1892. Fitz Hugh Lane, Becalmed off Halfway Rock. Martin Johnson Heade, Seascape Sunset. Winslow Homer, Dad's coming, 1873. World's 10 greatest Seascapes - The Sea in paintings. 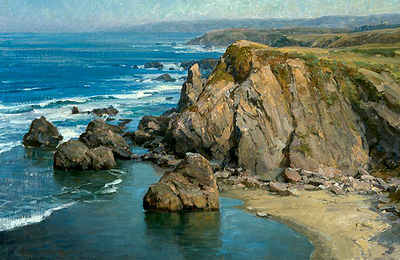 American Society of Marine Artists. "... our objective is to recognize and promote marine art and history..."
Thomas Chambers, Boston Harbor, ca. 1843. Hurricane by John Marin, 1944. This page was last modified on 26 September 2018, at 08:16.